I recently found myself over at the TED site watching some random videos. It’s a great site that will surreptitiously eat up hours of your time. It’s also interesting to see the various presentation styles and, at ten to twenty minute intervals, allow you to digest a large amount of information in a short amount of time. 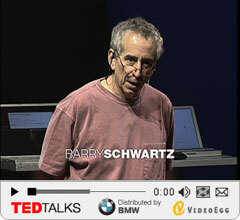 The presentation that really started the wheels turning tonight was by Barry Schwartz. It has to do with “The Paradox of Choice.” According to Mr. Schwartz, one of western society’s underlying values is that more choices means more happiness. And, in his eyes, this assumption is false. Sure, it may hold true to some extent. But then you devolve quickly into the realm of too many choices and find that you don’t want to make a decision, feel bad about making a decision, etc etc. Happiness does not increase linearly with the amount of choices that you are presented with. Of course, one of the first things that popped into my head was my choice to going into Accounting. Does the paradox of choice hold true here? I think it does. Think about it: as a student, you have a ton of choices. You can major in just about anything (notwithstanding family pressures, availability of major at your school, etc). The idea is that you choose something and you stick with it for the rest of your life. If I had continued my Computer Science major, I would have been stuck with it. Forever. That’s a long time for someone who is usually made to decide at some point in high school or shortly thereafter. Looking back to my life in general before I made the conscious decision to do Accounting and Information Systems, I was less happy in general. A large part of my time was sucked up just pondering the future. Yes, the possibilities were limitless. But that actually damaged my overall happiness. As soon as I made a choice that eliminated a lot of options, I was almost instantly happier. It’s not just me, either. I’ve seen it in others that have gone through the same decision making process. The results are pretty dramatic. Now that we’ve figured out that more choices doesn’t equal more happiness, how do we change our behavior? Well, I would say that there are unlimited choices for changing behaviors. But I guess that wouldn’t quite make us happy, now, would it? This entry was posted in information, ted. Bookmark the permalink. I really like the idea that having too many choices is what could be making a person feel uneasy. It seems so… salient, and simple at the same time.